THE SHOMAKERS Holiday. OR The Gentle Craft. 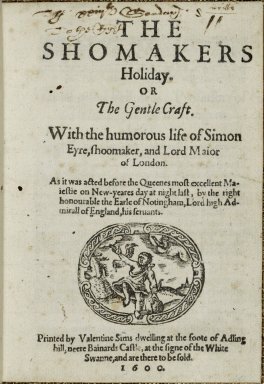 With the humorous life of Simon Eyre, shoomaker, and Lord Maior of London. As it was acted before the Queenes most excellent Maiestie on New-yeares day at night last, by the right honourable the Earle of Notingham, Lord high Admirall of England, his seruants. Printed by Valentine Sims dwelling at the foote of Adling hill, neer Bainards Castle, at the signe of the White Swanne, and are there to be sold. 1600. Title page imaged from Folger call number: STC 6523. Image is not from the transcribed copy.